Fall in love with deals this Valentine’s Day on smart light bulbs, a Tile Slim, a Bissell cordless vacuum, and more. The incredible Logitech MX Master mouse was the sequel to one of our readers’ favorite mice, and the new MX Master 2S is the sequel to the sequel. You still get an ergonomic design, great battery life, and a mouse sensor that works on any surface, including glass. But the 2S increases resolution from 1,000 DPI to 4,000, and introduces Logitech’s flow software, which lets you switch between computers on the fly, and even drag or copy files or your clipboard from machine to machine. Amazon’s marked the 2S down to $80 today, a $20 discount, and the best deal we’ve seen so far. Anker’s PowerCore line has long been our readers’ favorite brand of USB battery packs, and you can save big on the slimmest 10,000mAh model, while supplies last. The PowerCore II Slim appears to be the first PowerCore battery pack to include Anker’s new chipset, which delivers the fastest possible charging speeds to every USB device you own, including Quick Charge 3.0. That said, you’ll notice it’s not actually a Qualcomm-certified Quick Charge 3.0 product; it just replicates the tech on Anker’s own chip. That means less internal circuitry, and more room for battery, resulting in one of the thinnest 10,000mAh battery packs ever made. Today’s $26 deal doesn’t require a promo code, but it’s a solid $12 less than usual. Update: Today’s the last day of the sale. Anker has not one, but two brand new sets of truly wireless earbuds on the market, and both are on sale for Valentine’s Day. We just put up our impressions of both the Zolo Liberty and Liberty+ earbuds, but the gist is that they’re both solid, fitness-friendly options at a lower price point than most other competitors. The Plus model adds a transparency feature that uses microphones to let through a bit of ambient noise, customizable EQ settings, a case with 48 hours of battery life (compared to 24), and a few other features, but you can’t go wrong either way. You can get the basic Liberties for just $80 right now with promo code LOVEZOLO, or save $30 and get the Liberty+ for just $120 with code ZOLOLOVE, which is the best deal we’ve seen on those since their crowdfunding campaign. For just $19 today, you can grab Anker’s SoundBuds Surge lightweight Bluetooth headphones, a close relative of the SoundBuds Slim, which won our recent Co-Op. With magnetic connectors on the earpieces and a water-resistant coating, these would be a great addition to your gym bag or suitcase, even if you already have another set of earbuds. Tile is the ultimate device for anyone who can’t stop losing their things, and you can get one for just $19 right now, easily an all-time low for the 1-pack. Google Wifi is one of the highest profile competitors in the exploding mesh router market, and Amazon’s marking down their three-pack of Wifi access points to just $259, within $10 of the best price we’ve ever seen. Whether you need a small card for a dash cam, or a ton of space for Nintendo Switch games and 4K GoPro footage, these Samsung microSD cards down to great low prices in four different capacities. For a limited time, you can choose from all three lengths (there’s a guide to help you pick on the product page, but you can trim them every two inches to get the right fit) for 15% off with promo code ZZF6XQB3. If you aren’t familiar, these ease eyestrain when watching TV at night, improve your TV’s perceived contrast, and just look really cool. $19 is a really good price for a 45W USB-C Power Delivery wall charger, but this one is particularly notable for including a 6.6' USB-C to C cable in the box. That would normally set you back at least $5 or so on its own. 45W is more than enough to charge a Nintendo Switch or 12" MacBook at full speed, and it should be able to recharge a 13" MacBook Pro as well, albeit somewhat slower than its included 61W charger. Just be sure to use promo code PDWALLCH to get the deal. At the best price we’ve ever seen, buying this 8-pack of rechargeable AmazonBasics AAA batteries should be a no-brainer. As if 6TB wasn’t enough space for nearly everyone, this external hard drive includes a couple of USB ports on the front, allowing you to plug in even more external storage devices, or just charge your phone. $115 is an all-time low price, but it probably won’t last long. Our readers’ favorite USB travel charger pulls double duty as a USB battery pack, and you can get one for $21 on Amazon right now, almost $5 less than usual. I’ve had the Fusion since it first came out, and it quickly became my favorite Anker product ever, mostly because it’s the only Anker battery pack that you can charge by plugging straight into the wall. You can read all of my impressions here, and then head over to Amazon to get yours on sale. You probably won’t use them for at least a few more months, but these Anker dry bags can protect your phone from surf and sand once it’s finally warm enough to get in the water again. Get two for just $7 today on Amazon, while they last. If yesterday’s Amalfi Coast vacation deal didn’t float your boat, or if you couldn’t find a date that worked for you, Great Value Vacations (in partnership with Travelzoo) is also offering a great package deal on a trip to Ireland, with an extra $100 off per person when you use code LOVETOGO. Every package includes roundtrip airfare from a number of US cities into Shannon and out of Dublin, a rental car, daily breakfast, and nights in the B&Bs of your choice, so you can explore the country on your own, and not be tied to a tour group. By default, this package is for six nights and two people, but you can add more of both, and fly out of basically any airport, though prices will vary by location and date. Pricing out of JFK was pretty consistently under $1,000, but it seemed like most other departure cities had the best prices in August and September, so be sure to check the calendar to get the best deal. Just be sure to have a Guinness for us once you get there. Add some copper to your kitchen with this Gotham Steel Gold Box, which includes a 15-piece cookware set, 5-piece bakeware set, and 3-piece frying pan set. All of it is this nice copper color, so if you’re into that, all the items in this Gold Box are $20 to $30 less than usual. It’s too late for Valentine’s Day, but Amazon’s Prime Surprise Sweets box is back down to $14 today, down from its usual $18, matching an all-time low. You don’t get to pick what comes in the box (it’s a surprise, after all), but previous boxes have included cookies, brownies, brittles, candy, and even donuts. I think it’s a safe bet that there will be sugar involved. Throw this $10 AmazonBasics umbrella in your car. It’s just 50 cents away from the lowest price ever. You can thank us later. This clever light switch has a screen built right in, allowing you to program its connected light and fan on a seven day schedule. It won’t connect to your smartphone like a lot of smart home gear, but it works with basically any light fixture, and is within $1 of an all-time low price today at $28. It’s 2018, and your vacuum cleaner shouldn’t have a cord anymore. 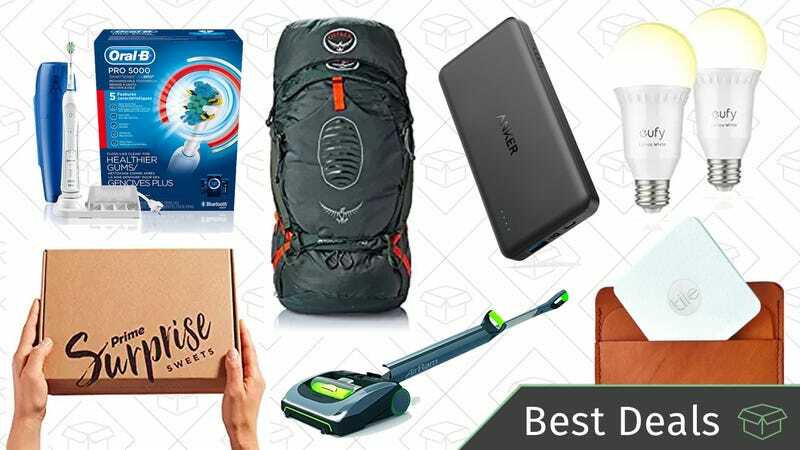 Luckily, you can save $40 on this uniquely-designed Bissell AirRam. The AirRam includes a rechargeable lithium ion battery that can run for 30 minutes at a time, a multi-surface brush roll, and LED lights to help you track down dirt. The feature that really sets it apart though its its slim design and lie-flat handle, which allows you to slide it completely under couches, beds, and other furniture, which hopefully means you’ll actually clean those areas more than twice per year. Shopping for pillows can be a snoozefest, but pillows are something that should be replaced every once in a while. If you can’t remember the last time you bought some new ones, Amazon has got you covered today with the a historic-low price on this 2-pack of Sable pillows. They’re stuffed with hypoallergenic down alternative, and are said to be ideal for everyone from stomach to side sleepers. You don’t need to buy a new car to enjoy the life-changing benefits of a rear-view camera; you just need $64 and a few minutes to install one yourself (with promo code CMI9M63M). This model doesn’t even require you to run a wire all the way to the front of your car; a wireless transmitter can just stay in your trunk and beam the picture to the included screen from up to 100M away. After you clip the $4.50 off coupon, the price on this Outland propane fire pit is the best it’s been in over a year. You can use this firebowl to enjoy your patio this spring, or bringing along on camping trips with convenient lid and carry kit. The reviews on this product, albeit limited right now, are pretty stellar, so if you’re in the market for a fire pit, this would be a good thing to try out. Furbo Dog Camera, which is almost back down to its Black Friday price. It might seem a little ridiculous to some, but could be super helpful if your dog has separation anxiety, or if you find yourself wondering what your pup does all day while you’re gone. After you connect the device to your home’s Wi-Fi, you can use the app to see, talk to, and dispense treats to your dog. It even doubles as a security camera. It was $169 over the holidays, but has been since for over $200 for several weeks, so today’s price of $179 is something to wag your tail about. We’ve seen several deals recently on Anker’s hub-free smart light bulbs, but if you don’t mind buying a 2-pack, today’s discount is the best per-bulb price we’ve seen. Kitchen scales are a necessity, especially if you do any baking. This one has a nice modern look and easy-to-clean glass top. Today, you can buy it for just $7 (with code 2VEOS7M9) and weigh in on your own. Yes, I guess you could fold a sponge in half and achieve something similar, but today’s price of just $6 is the lowest we’ve ever seen on Amazon, and the brush bristles provide more scrubbing action. Today only, Amazon’s running big discounts on the iconic Casper mattresses; much larger than you’d ever see on Casper’s own website. The queen is down to $796, which is almost $200 off, and other sizes have similarly sizable discounts. You’ll also get the same 10 year warranty and 100 night trial period that you’d enjoy if you bought from Casper directly. Pop Chart Lab’s newest poster is comprised of dozens of common English language mistakes, with examples and definitions to help you learn how to write good. Irregardless of whether you’re disinterested in proper grammar, it’s such a well designed poster, you’re basically insured to enjoy it. You can save 20% for a limited time with promo code LITERALLY20, which is literally the best code I’ve ever seen. Score the best price ever on this 20-piece food storage set with snapping lids. These microwave and dishwasher containers are selling for $10 less than usual, so if you’re in the market for some new leftover containers, I’d grab this deal before it’s gone. 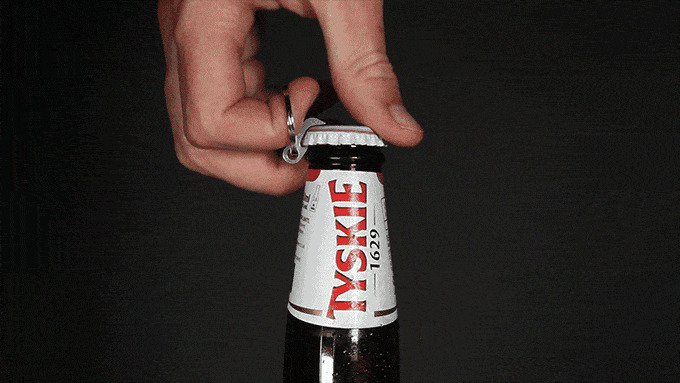 This lilliputian libation lid liberator leisurely lies in wait until you need to open a bottle, pry open a paint can, or slice open your latest Kinja Deals purchase. Get if for fifteen bucks as of this writing for a preorder. For a limited time, Dyson’s eBay outlet is taking an extra 20% off any $25 order (maximum $50 discount) with promo code PRESDAY, including vacuums, fans, and even hair dryers. They sell a lot of new stuff on eBay, but the best deals are on the refurbs. Either way, they’re sold directly by Dyson; this isn’t a sketchy third party situation. That same PRESDAY code will work with a number of other (admittedly less exciting) sellers as well, including Klymit, KitchenAid, Worx, and more, so check out the full list on this page. Pick up this large 299-piece first aid kit for just $12. It’s full of bandages, scissors, anti-bacterial wipes, and gauze, and it’s perfect to store in your car. You can thank us later. Thousands of our readers have purchased Vansky’s motion-activated under-bed light, and Jackyled recently launched its own version, and you can get a set for just $5 today with promo code DOZGB8ZR. These are great for shuffling to the bathroom at night without stubbing your toes, or lining under shelves for soft light. Just remember to add the promo code at checkout. These $7 gloves let you grab a hot pan out of the oven, pull meat right off a grill, or even turn logs in an active campfire without getting burned, like some kind of kitchen superhero. We’ve seen silicone barbecue gloves for less than this in the past, but these are rated for much higher temperatures, and should be more flexible as well. Use code XJZ2UX6N at checkout. As you know, keeping your knives sharp keeps you safer, since you’ll have to use less pressure to slice. A whetstone (or water stone) is how the pros keep their knives in the best shape, and this one is just $11 today, the cheapest it’s been in over 6 months. So, if you’re looking to do your own knife sharpening, get this deal before it’s gone. I would recommend watching a couple of videos on how to do it, if you’ve never tried before. Osprey Atmos AG 50 Backpack | $140 | Amazon | Graphite Grey. Small and Medium only. Osprey makes some of the most popular hiking backpacks out there, and Amazon’s running a great deal on the Atmos today, in two different sizes. $140 is within $13 of an all-time low on the small model, and within $3 for the medium, but both are the best deals Amazon’s listed this year. Every Atmos includes a special sleeve for hydration packs, a floating top lid for accomodating oversized loads, a trekking pole attachment, and a bunch of adjustable straps and harnesses for maximum comfort. Note: The deal is only available on Graphite Grey. I recommend taking it to Ireland! Today’s $100 price tag is a match for an all-time low, so you can really flex those savings muscles. The silver medalist in our favorite electric toothbrush co-op, this Oral-B 5000 is just $55 after some stacked discounts - clip the $15 off coupon and use promo code 30OB5000VD2. If the price doesn’t convince you, our readers love this toothbrush because of its superior oscillating, pulsing, and rotating brush head. It also connects via Bluetooth to an app on your phone and can show you were need to brush more, and store data for your dentist to review. This deal will probably not last long, so get while you can. Yes, spring is still over a month away but that doesn’t mean a girl can dream of not having to put on six layers before leaving the house. If you’re also counting down the days where you can free your ankles from the confines of boots, Joe’s New Balance can get you even closer. Pick up a pair of 490v5 sneakers for just $30, shipped, with the code KINJA490. Let’s say you’ve already upgraded to a good toothbrush; what’s the next step for cleaner teeth? Well, this 14-treatment box of Crest 3D gentle Whitestrips is a great place to start. Just be sure to clip the $5 coupon before you check out to get them for $25. What better way to get ready for the better weather than discounted Under Armour Outlet gear? They just added a ton of styles to their Outlet, with up to 40% off, no code needed. From the classic Under Armour long-sleeves to training shoes to their Threadborne microthread technology, this gear is perfect for running outside in the upcoming warmer months. If reliability is something you crave in a pair of shoes (if it isn’t, you may need to reconsider), I bet you have Cole Haan in your closet. And if you’re looking for a new pair but don’t want to spend the normal asking price, Cole Haan is taking an extra 40% off their sale section with the code EXTRA40. Finally get a pair of ZERØGRAND’s (or the newer 2.ZERØGRAND’s) or waterproof boots that you’ll probably need in less than a month. This audiobook version of The Fellowship of the Ring won’t put even a hobbit-sized hole in your wallet. For just $5, you can listen along to the first book of Frodo and the whole crew’s epic journey while your cleaning, commuting, or cooking all 6 of your daily meals. In addition to its timely Black Panther sale, Comixology is also running a number of romance-centric comic sales for Valentine’s Day. Options range from Spider-Man/Spider-Gwen to Archie to Scott Pilgrim, plus a bunch of Indies, and more. Have any particular recommendations? Drop them in the comments. Need something to get you through the slogs of The Longest Shortest Month? Amazon is having another Kindle sale, this time full of mystery, science fiction, and thrillers (which sounds like a bad dating profile), all for under $4. Pick up page turners that’ll keep your brain occupied while everything else outside is just... blah. Just in time for the release of the film, Comixology just kicked off a massive Black Panther sale, with hundreds of single issues available for just $1 each, plus big discounts on collections from every era of the series, including the recent issues written by Ta-Nehisi Coates. Want to recommend a particular issue or collection? Let us know in the comments. Massdrop’s Vast 35" curved gaming monitor is back up for order again, and it’s just $600, if you hurry. That’s a lot to drop on a screen, but you get 3440x1440 resolution, 2ms response time, 100Hz refresh speed, and yes, that curve. For context, the ASUS ROG Strix is the same size, resolution, and curvature, has a slower response time at 4ms, and costs $200 more. Bitcoin miners have made graphics cards hard to find in stock these days, let alone on sale, but Massdrop has a limited quantity of this Gigabyte GTX 1060 available for the eminently reasonable price of $370, or about $130 less than Walmart.